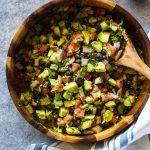 Avocado, black beans, tomato, onion and cilantro dressed with olive oil, garlic and lime making this salad a healthy nutritious choice for a side dish or a filling meal. In a small bowl, whisk the olive oil, lime juice, garlic and salt & pepper to taste. 0 Response to "Avocado & Black Bean Salad"